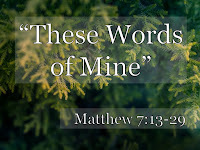 [Matt's Messages] "These Words of Mine"
It’s been forever since we’ve been together in the Gospel of Matthew. We started our series back in December of 2017! And this is the 19th message in this series. But we’ve taken a lot of breaks along the way, especially the last four Sundays! Joel preached while I was at Challenge, the Challenge group brought their report, and last week was Family Bible Week so it was over a month ago that we were in the Gospel of Matthew together. Well, the answer is “The Gospel of Matthew.” And our series is called, “Following Jesus” because that’s what we’re learning to do as we study Matthew’s Gospel. Matthew is a theological biography of the Lord Jesus Christ. Matthew tells us who Jesus is, His background, His backstory, His baptism, everything. He called His first disciples to follow Him and make more followers of Him, and He began teaching, preaching, and healing. It is the first of five major blocks of Jesus’ teaching in the Gospel of Matthew and arguably the most famous. Like a new Moses, Jesus went up on a mountainside and delivered His kingdom manifesto. And He taught with unparalleled authority. In fact, look down to the last two verses of chapter 7 to see how the people responded this sermon on the mount. Look at verse 28. These people were astonished by what they heard. We have grown familiar with so many of these teachings. They are very famous and rightfully so. Ever since February, we have been slowly working our way through these teachings, and we have come to know them. But the first people to hear these teachings were flabbergasted by them. They were knocked off their pins. “I don’t know. I’m amazed, too. This guy teaches like no one else. He teaches with His own authority. Just as important as understanding what Jesus is teaching is to understand Who Jesus is as He teaches it! Jesus does not teach like one of the scribes. One of the other teachers of the Law. Jesus teaches from His own authority. We’ve seen that again and again. Remember the “But I Tell You’s” from back in chapter 5? We’ve reached the conclusion of Jesus’ message. Do you remember how He started it? With the Beatitudes? Jesus invited us to live the good life, the blessed life, the “Good on you” life, the flourishing life–as His followers. But what He said was the good life was completely surprising. Do you remember? Jesus invites us into an upside-down kingdom. His values are not the world’s values. Jesus said blessed are the needy. The sad. The lowly. The unsatisfied. The persecuted. Those are the kind of people Jesus says are in a good place! Which good news if you know you are needy! And it’s not just an upside-down kingdom. It’s also an inside-out kingdom. Do you remember this? Jesus calls His followers to live a whole life, a perfect life, that is a life that is the same on the inside as it is on the outside. It’s not good enough to just have an external righteousness. Jesus insists that His followers have a greater righteousness than the Pharisees and the teachers of the Law. They were totally focused on the externals, but Jesus drives to the heart. It’s not good enough for Jesus that we keep from murdering each other. We aren’t allowed to hate each other. It’s not good enough for Jesus to keep from jumping into bed with someone who is not your spouse, we aren’t allowed to lust after each other. It’s not good enough to just keep certain oaths. We are to be totally trustworthy. It’s not good enough for Jesus for us to just love our neighbors. He wants us to love our enemies. Because His Father sees our insides. Not just outsides. That’s why we can’t just give or pray or fast when people are watching and for their approval. We’ve got give, pray, and fast when nobody sees but the Father. The kingdom’s values are very different from the world’s values. The world values money. We aren’t allowed to serve both God and Money. The world values worry. We aren’t allowed to worry about our futures. The world values judgmentalism. We aren’t allowed to condemn others. In fact, we are called to do to other what we would have them do to us. That’s what Jesus is telling us to do! That’s the kind of kingdom that Jesus is inviting us to join. Upside-down, inside-out, counter-cultural, counter-intuitive, Kingdom of Heaven. Because that’s the part of the Sermon we’ve finally got to. The part where Jesus gives the invitation. Jesus calls for a response. In Matthew chapter 7 verses 13 through 29, Jesus lands the plane. And He does it in a very strong way. While He was very tender at beginning of the sermon, He is very firm at the end. Because there are only two ways to respond to Jesus’ teaching. A right way and wrong way. And Jesus invites us to respond the right way and warns us not to respond the wrong way. He does this with a series of contrasts that reveal the two ways. Two roads, two trees, two claims, two builders. He says that in verse 24 and again in verse 26. And I don’t know how many times I’ve missed those words as I’ve read this chapter. Jesus is calling for a response to His sermon, to His teachings. Not just to God’s words and God’s teachings. The teachers of the Law did that. But Jesus is calling for a response to these words of His. #1. TAKE THE HARD ROAD. Look at verses 13 and 14. As Jesus concludes His message, He says that there are two roads. Two ways to go. And they are very different. And they lead to very different destinations. And Jesus makes abundantly it clear which road He wants us to take. There’s no question about it. There is no neutrality on this question. He is not saying that they are equally valid roads. It doesn’t matter; just choose one. He is saying that there is right road and a wrong road. The right road is the narrow road. A small, narrow gate and a very narrow road to walk. That’s the one to take. He says the other road is a lot easier and more popular. It’s gate is wide. You can take extra stuff with you when you cross into it. The road is broad, you can careen all over it. Many people go this way. It’s very popular. It’s very comfortable. It’s very easy. And it leads to destruction. But the other gate, the other road is small and narrow and confining and unpopular. But it’s the road to life. What is He is talking about? He’s talking about following His teachings. He’s talking about receiving the Sermon on the Mount and living now as a citizen of the kingdom of heaven which is near. It’s no fun. At least at first. Not very people choose it. But it’s the road that leads to life. As you look back over chapters 5, 6, and 7 of the Gospel of Matthew, would you say that this life is the life that you’ve chosen? That this kingdom is the kingdom you are living for? Upside-down, inside-out, counter-cultural, counter-intuitive, kingdom of heaven? I don’t mean do you live out these values perfectly. I’m sure you don’t. That’s actually kind of part of the point. If you know you don’t then you are poor in spirit and know that you are needy. And, ironically, that means that you are living them out. If you think you have it all together, then you certainly don’t! But have you embraced Jesus’ teachings and decided to follow Him on this road? Look back over chapters 5, 6, and 7, and you’ll see that Jesus is calling us to walk a difficult path. “Small is the gate and narrow the road,” but it leads to life! Jesus says that there are going to be people out there who are going to seem like they are people worth following, people worth knowing, people who are God’s sheep just like you and me, but actually are ferocious wolves. They are completely and totally dangerous to us. And we need to keep on the look for them. These people are not a genuine part of the inside-out kingdom. On the outside, they look like followers of Jesus, but on the inside, they most certainly are not. These false prophets regularly recommend the wrong road. They invite us onto the wrong road. And they warn us against the right road. That’s the definition of false prophet. But they can look so good! They can be great communicators. Awesome story-tellers. They seem to have it all together and have all of the answers. The Pharisees were like that! Everybody thought those guys were the godly guys. But most of them were actually fakes. How do we know which ones to listen to? How do you know whether or not to listen to me, for example? Well, one way is to line up what I’m teaching with what Jesus is teaching here and see if they match. If I’m encouraging you to go the wrong way, you should run away from me, right away. Jesus loves to use this metaphor. He says, if you are not sure whether or not they are good teacher or a bad teacher, just give it a little time and watch what comes out of their life. They might seem good at first because they have on the sheep’s clothing, but eventually a wolf will act like a wolf. A good tree bears good fruit, and bad tree bears bad fruit. Sooner or later. Eventually, ultimately, you can tell by watching their lives. And the Lord is also watching their lives. And if they continually produce bad fruit and prove to be a bad tree, they become firewood. Beware of whom you listen to. I think that Jesus is continuing this same thought in verse 21. You do have to call upon the name of the Lord. You do have to confess with your mouth Jesus is Lord. But that’s not good enough if He really isn’t. Now, I think that, in general, the wrong people get scared by that teaching from Jesus. People who love Jesus and are following Him by faith should not be scared of those words. They should watch out for those people who are like this. They should beware false teachers who do lots of things in the name of Jesus even preaching and prophecies, and miracles. But they don’t really know Jesus. You don’t want to be in their shoes when Jesus says that He doesn’t know them. There’s no real relationship there. And you can tell because they chose the broad path. And it showed in their fruit. It was clear from the fruit of their lives they did not trust and love and follow Jesus. Now, if that is true of you, then you should be scared. Beware of fake Christianity in your own life. The proof is not church attendance or church activity or singing songs or giving alms or even doing prophecies and miracles in the name of Jesus. The proof is in the fruit. The proof is in what path you have chosen. Have you taken the narrow road? Have you chosen to trust and love and follow Jesus? Are you a citizen of this upside-down, inside-out, counter-cultural, counter-intuitive, counter-your-own-sinful-heart kingdom? If so, then don’t worry. Jesus isn’t talking about you. Jesus is telling you to watch out for people like that. “Therefore [notice that! Therefore. He’s drawing it all to a conclusion. Therefore] everyone who hears these words of mine and puts them into practice is like a wise man who built his house on the rock. [Like the wise man in Proverbs that we looked at last week.] The rain came down, the streams rose, and the winds blew and beat against that house; yet it did not fall, because it had its foundation on the rock. Isn’t amazing Who Jesus thinks He is? Look at verse 28 again. They were right to be amazed. Because Jesus is saying if you build your life on His teachings, then you will stand. Your life will stand the test of time and the test of eternity. But if you don’t build your life on “these words of mine,” of these words of Jesus, then you will fall with a great crash. Now, He’s not saying that you can save yourself by putting His words into practice. But He is saying that if you are genuinely trusting Him with genuine faith, then you will put His words into practice. And it will be obvious. I’m sure that both of these houses looked great. But when the storms comes, all will be made plain. Do you feel the invitation and the warning from Jesus’ conclusion to His sermon? He is warning us to not ignore these words of His. Look over chapters 5, 6, and 7 and ask yourself if you are building your life on these teachings. And ask yourself if there is evidence that you are. They are not optional for those who would want to enter into the kingdom, to enter into life, to flourish now and forever. Jesus is warning that we don’t build our lives on His teachings that there will be great destruction. He is that important. What He says is that important. And at the same time, Jesus is inviting us to build our lives on the solid rock of His words, on the firm foundation of His teachings. His teachings are sometimes hard to swallow. It’s not the easiest road to walk. And we get to walk it with Him! We’ve had a fantastic Family Bible Week here at Lanse Free Church. As your pastor, I’ve got to say that I am so proud of you. It takes a whole church to put on a terrific week of Bible teaching, worship, fun, fellowship, and evangelism like that each year, and this was a really good one. Thank you to everyone who served. It takes a big team to get this kind of Game On, and everybody played their part so well! 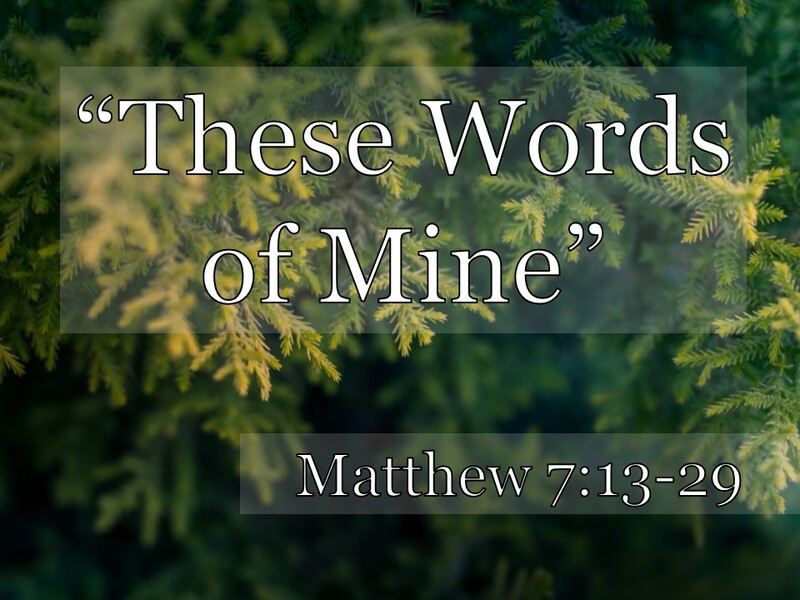 Next week, I hope to return to Jesus’ Sermon on the Mount in the Gospel of Matthew and maybe even finish studying The Sermon on the Mount together. We started it in February, and we haven’t even looked at it for a whole month! It’s about time we complete that loop. But because this is Family Bible Week, and because the adult class has been studying the Proverbs all week, I thought it would be best if we were in the Book of Proverbs together today. And this particular passage, Proverbs chapter 30 verses 1-6, is about WHY we have Family BIBLE Week in the first place. Why do we have Family Bible Week? Why is Bible our middle name for these events? In the Summer, Family Bible Week. During the school year, Family Bible Night. And each and every Sunday, our central message come across in the preaching is the B-I-B-L-E.
Now, I’ve been to churches where there is very little preaching from the Bible. The Bible is on display, but it isn’t central to the life of the church or to the believers in that church. Several of you told me this week, that you had never heard the stuff we were learning in the Adult Class even though you grew up going to church! The Bible was not opened. It wasn’t studied. It wasn’t preached. It wasn’t taught. And you weren’t encouraged to read it for yourself! Why is the Bible so central to our ministry here? It’s because the Bible is God’s Word, and it is completely and absolutely trustworthy. You can take what it says to the bank. And that’s the message of Proverbs 30, especially verses 5 and 6 today. I want to get us to verses 5 and 6, but to truly understand them we have to get to know the person who wrote them. Some people think that Agur was a pseudonym for Solomon, a pen-name, but I don’t see much evidence for that. I think he was just another person God used to reveal Himself to us, and God’s people recognized that and included his sayings in this chapter of Proverbs for us. The Bible says that his words here in Proverbs 30 are an “oracle,” or King James, “prophecy” or as the 2011 NIV says, an “inspired utterance.” They came from God. And verse 1 says that he spoke these words to Ithiel and Ucal whom we also don’t know anything about. Are they Agur’s sons? We don’t know. I wish Heather and I had named a couple of our sons, Ithiel and Ucal. Wouldn’t that be fun? Which one is Ithiel and which one is Ucal? Biblical scholars aren’t 100% certain about which vowels belong where here because the original text didn’t have any vowels; they were just understood or implied! Listen again to how he feels about himself. V.2. Here is one great big, “Duh” coming from Agur! We sang it this morning. W-I-S-D-O-M.
What does Agur have here? What is another name for this kind of humility before God? “The fear of the LORD,” right? That’s the beginning of knowledge. That’s the beginning of wisdom. It’s also in the wisdom literature. The Book of Job, right? What is the answer to all of those rhetorical questions? What man has done that? You done that? The answer is nobody knows anything trully and fully and comprehensively. I do regularly. There is so much I don’t know and so much that I so often get wrong. And other people fail me, too. I have some heroes, especially some pastors and theologians who are my heroes, but they have feet of clay. Let’s chew on that. Ruminate on it like we’ve learned this week in our class on Proverbs. This proverbs is a little different than some of the ones we looked at this week, but it’s still a proverb and operates in much the same way. Let’s think about it together and turn it over in our minds. God is absolutely trustworthy in everything He says 100% of the time. 24/7/365.25! And “inspiration” means “breathed out.” From God. Wow! That is such good news. Now, that doesn’t mean that there was a time when God’s word was impure or flaw-full. It didn’t go through a refining process. Agur is saying that this just the way the Word of God is. Of course, that doesn’t mean that I understand all of the words of God. I certainly don’t, and I don’t know anyone who does either, though there are people much wiser than I am. And there are other places in Scripture where small copying errors have crept in over the centuries, and we have to make a judgement call about which reading is original. The Lord has so preserved His word that we have today virtually the same thing that was written thousands of years ago. If they do, ask them which ones and then look them up. But the problem, it seems to me, rests in my understanding of the solutions, not in the words of God. 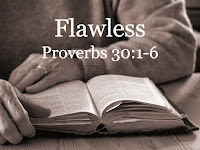 But because Hebrew and Greek are not the same as English, and because English changes throughout the years, it will take many English translations for us to “get” what is embedded in the flawless words of God of Proverbs 30, verse 5. The NASB is like that. Very good, very wooden. The King James Version is over 400 years old and going strong! Long Live King James! I refer to it each week as I study. It has been a true gift to the church. I think there are places where it can be improved in its textual basis and especially in its modern English. Sometimes we don’t know what it’s talking about because we don’t speak that English anymore. But it’s a good translation. As is the New King James which took out some of the thees and thous and other ancient language that we don’t use and neither did the authors of Scripture. The translation my wife uses is the English Standard Version or ESV. I’ve been reading that, too, for the last fifteen years. It’s more on the word-for-word side of things, and its translators have tried to keep the feel of the King James while giving the best of up-to-date faithful scholarship to the translation. It’s the version that we’ve been using in the Gospel Project in Sunday School the last 3 years. I highly recommend the ESV, and if I were starting my preaching ministry today, I might preach from it each week. For the last twenty years, I have been preaching from the NIV, the New International Version of the Bible. For many years it was kind of our central Bible currency here at Lanse Free. How many are looking at an NIV right now? And I’ve been preaching out of this copy which has the version published in 1984. It originally came out in 1973 (when I was born), then was updated in 1978, and then found it’s final form in 1984. And then in 2011, the Committee on Bible Translation published an updated version also called the NIV. Does anybody know if they have the 2011 NIV? How many know that they have a newer one? The 2011 NIV has a slightly different translation philosophy than the 1984 version and a number of significant changes to it because the translators believe that English has changed significantly since 1984. So there is a newer NIV. It’s actually 7 or 8 years old now. It’s a really good translation, and I expect to start preaching some from it over time. It’s the one that we’ve been giving to the graduates for the last several years. Another new Bible translation that just came out last year is the Christian Standard Bible or the CSB. It’s also a full scale update of a version called the Holman Christian Standard Bible. It’s a lot like the NIV to me. Very readable and very accurate. He was the word stylist for the whole CSB so that it reads so fluidly. I’ve been using the CSB Study Bible as I preach through the Gospel of Matthew, and I find it very helpful. The Catch the Word memory verse we did this week for Family Bible Week was from the CSB, and our new Sunday School materials this Fall will also be using the CSB. But they all agree that “every word of God is flawless,” and that we should not tamper with it. Have the fear of the LORD! I would not want to be in their shoes. Don’t confuse His meaning and throw in your own stuff. #4. TAKE REFUGE IN HIM. Now, let’s do a Proverbs analysis of verse 5. Like we did all week in the adult class. The Hebrews liked to what? Where would you divide this one up? Is there and A line and a B line? A. Every word of God is flawless. B. He is a shield to those who take refuge in him. Is one a wise line and one a foolish line? What is the relationship between the A line and B line? They are saying the same thing. A = B. Do you see that? The second line is saying the same thing as the first line. They are both wise lines because they are both about God. I love how the focus shifts from the words of God to the author of those words. In fact, He is a shield. Is that just good information? The proverbs are not just informational they are...transformational. Agur wants you to take refuge in the LORD. Because every word of God is flawless. That’s why we have Family BIBLE Week every year! That’s why we have an adult class at Family Bible Week. That’s why I preach from the B-I-B-L-E. So that we can go get the wisdom that we need for life. 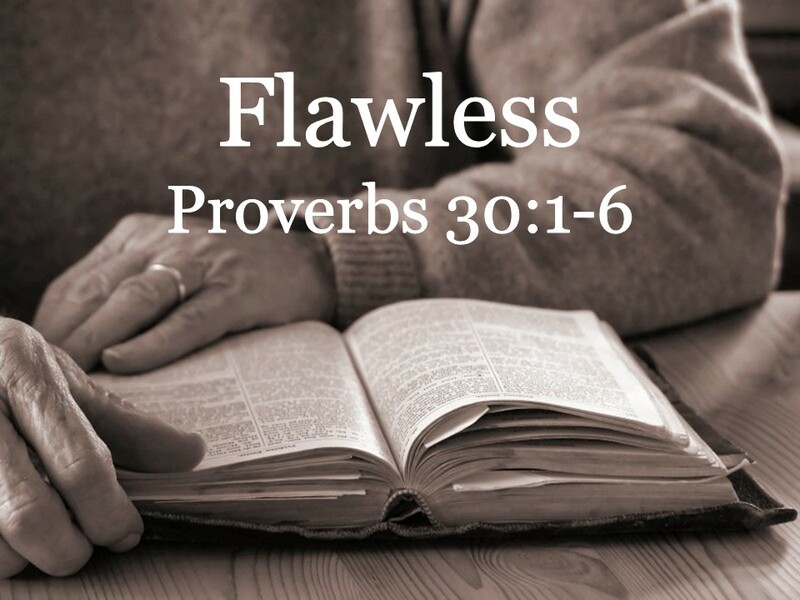 If every word of God is flawless, why wouldn’t we read our Bibles? Imagine a friendship where only one of you talks and the other person just listens. And never the other way around. How about I stop listening to you and just talk from now on? What is your plan for meeting with God over the pages of Scripture this week? I’ve tried to show our adult class how they could just take one proverb a day and meet with God over that one proverb and how good that would be for growing in the art of living skillfully. Of knowing the right thing to do in a given situation. Of being a wise person. July is birthday month for our family. Heather has a birthday. Robin has a birthday. She just turned 18! Peter has a birthday. He just turned 15 last week. Isaac has a birthday. He just turned 14 and was one of our teachers for Family Bible Week. I can’t believe how old they are all getting. Drew will be 17 in December. There was supposed to be another July birthday in our family. Her name was Charis, and she would have turned 19 this month if we had got to keep her. Back in 1999, Heather was six months pregnant with a very active little girl. We realized that something was wrong and took a painful ride to a hospital to confirm our worst suspicions. I have never cried so hard or so long. I just talked to the teens at Challenge about that terrible day. We drove back home. Heather was induced, and we held our little one in our arms for the first and the last time. In that time of terror and sadness and grief, Heather held onto Romans 8:32. But we knew then and we know now that, “His divine power has given us everything required for life and godliness through the knowledge of him who called us by his own glory and goodness. By these he has given us very great and precious promises...” (2 Peter 3:1-2a). And they will call come true. Readers with good memories might recall an earlier version of this sermon, preached in April of 2012. A couple of years ago, I was introduced by a mutual friend to a retired pastor who had written a manuscript about the prayer pattern Jesus taught His disciples which we tend to call the Lord's Prayer. John Crocker was looking for feedback on his work and help in navigating the publishing world. 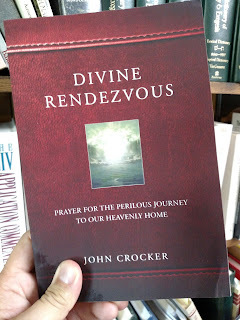 In Divine Rendezvous, veteran pastor John Crocker takes readers on a guided tour of the most important prayer in history. Reading it was nourishing for my soul. Crocker helped me to push past over-familiarity and see profound things in the Lord's Prayer that I had always missed before. I recommend this book for both new believers and mature disciples to learn how to pray as Jesus taught us. Today, I get to hold the finished product in my hand! Thank you, John, for sending it my way. Congratulations on its publication! They are also available on Amazon. You might want to pick one up to read it this summer. It's good for your soul.